Take a unique historical trip down memory lane in the 1940s, 1950s, and 1960s with a humorous and endearing collection of stories involving immi- grants, survival, growing up, coming of age, and learning what it is to be an American. More than a memoir, it’s an experience—a love story of family, friends, neighbors, and a famous and infamous neighborhood. Twin brothers Joseph and John Gindele grew up on the rough streets of Yorkville (known then as a “bucket of blood”) on Manhattan’s ethnic Upper East Side over 60 years ago. This is their story— what the city was like then, how it changed, and how two kids from immigrant parents became accomplished Minnesota schoolteachers with earned doctorate degrees. It’s an American tale full of adventures and laughs, sweet memories and sad moments. How did their Czech and German parents [two remarkable people who lived unremarkable lives] and siblings—a family of seven—ever survive living with twins who share special bonds and predictive abilities? Learn about the historical, social, and cultural conditions of the 1940s-1960s. Join the Gindele twins on their journey and (1) Rediscover your childhood memories—memories you only thought you had forgotten, (2) Live the immigrant experience in America, and (3) Have fun and lots of laughs doing so. Grab hold of your seat and get ready for a real hoot! Hold your breath! Here comes trouble! • Share the twins’ rich memories and outlandish adventures growing up. • Explore those special bonds and predictive abilities many twins and multiples have. • Find out how they survived by thinking and working out of the box. • Understand better what it means to be an American. • Learn about the colorful Yorkville of yore. • Book Club discussion questions are available. See monograph on “Order” page. 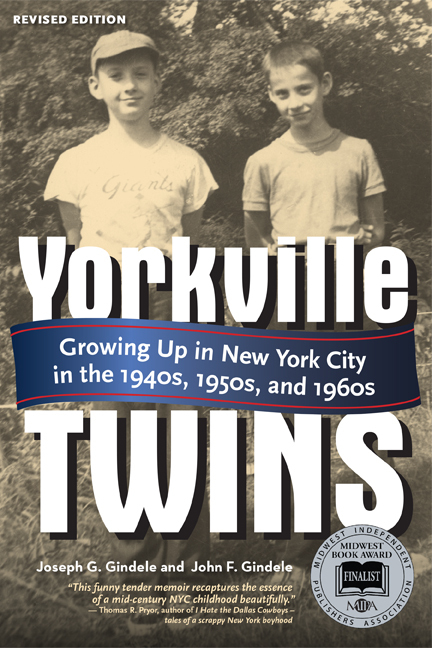 [*This 2015 Revised Edition replaces our 2012 First Edition of Yorkville Twins: Hilarious Adventures Growing Up in New York City, 1944-1962 [ISBN: 978-0-9839337-5-5]. “In the 1940s and 1950s, . . . most [large urban city] people lived in a four- or five-story, walk-up tenement building. Often their apartments had no toilet. Families would share a common toilet in the hallway. There were no showers. The only bathtub in many cases was a washtub located in the kitchen, a tub so small the best a full-grown person could do was sit on the edge and put his or her feet in the water. . . . There was little or no privacy in the railroad style rooms. Top banner photos from left: John Jay Park, Franklin D. Roosevelt (FDR) Drive overpass by 78th Street and the East River, looking north; 86th Street subway signage, NYC, adapted (Roberto C. Tobar, photographer); Orwasher’s bakery at 308 East 78th Street, New York City (212 288-6569). A Yorkville landmark since 1916, providing hand made artisan breads and fine food; Gracie Mansion is the official residence of the mayor of New York City. Built in 1799, it is situated in Carl Schurz Park at 88th Street and the East River; Statue of Liberty in New York harbor; Joe and John Gindele. © 2012–2018 Golden Valley Publishing Co., 3540 Yates Ave. No., Minneapolis, MN, 55422. All rights reserved.